You’re still using using carbon paper for credit card payments. While this method may have been the standard at one time, today it is more of a inconvenience and security risk than anything. Sure, these imprinting machines are cheap, but they’re completely dated. If a card is declined, you won’t find out until days after your customer is gone, and then it’s your inconvenience to track them down for a proper credit card. You know, because you have time for that. And on the chance that you lose these carbon paper slips, you’re not only out a lot of money (since you won’t be paid by those people), but your customers’ information could also be seriously at risk if it winds up in the wrong hands. You hear the dial-up sound when processing your customer’s credit card payment. If you use a credit card or POS system that uses a telephone connection to process the payment, it will require installing a separate land-line to facilitate the outgoing call. This is a separate, unnecessary expense for your business. Just like VoIP telephone systems, POS systems can now be seamlessly and reliably integrated online. You have long lines at your cash register. The truth is, when you build up a long line at your cash register, it means your check-out processes are slow. No customer likes waiting in lines, and the more frequently they have to wait 10 minutes to check out, the less likely they’re going to return in the future. Current POS systems process payment quickly, while also updating your inventory, encrypting customer information, integrating with your accounting system, and making your employees’ jobs easier. If you do business on the road, you mail invoices to collect payments. Mobile payments is a booming industry these days. Options are plezntiful for small businesses that want to accept credit card payments outside the four walls. You can do so with mobile credit card readers that connects to your cell phone as well as a POS mobile app through your smartphone or tablet to accept payment in a way that is quick, secure, and convenient. You accept checks, but not credit cards. We’re living in an increasingly plastic world. If you believe that cash is king, and that you are thumbing your nose at the payment processing companies by avoiding their fees, you might want to know that you’re likely also hurting your bottom line. Your unwillingness to accept credit cards may cause you to miss out on a significant customer segment that doesn’t carry cash on them. Intuit GoPayment estimates that businesses that do not accept credit cards lose up to $7,000 a year in sales. These days,interchange fees, especially in the case of some mobile payment providers, are lower than those you are charged through your average POS system, and much of the equipment you need to process credit cards can be offered for free when you open a merchant account. 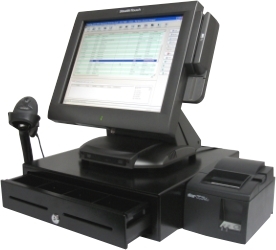 For assistance finding the best fit POS System for your business, contact us at BarcodesInc.